Surrendering to how it shapes us. Padma Gordon, Spiritual Counselor, movement educator, mother — lover of life who guides people to deepen their connection to body, heart and soul. It’s a gloriously sunny Saturday morning and I’m sitting at the table with my daughter, Meera while she eats her french toast. All of a sudden, I am awash with gratitude for her presence in my life and amazed by the depth of love I feel just sitting there with her. In the background, Stevie Wonder’s warm, buttery voice croons, “For once in my life I have someone who needs me,” and my eyes brim over with tears. It’s one of those precious moments that comes from having stepped across a threshold which deposits you into the land of Motherhood. We are currently in the window of Mother’s Day and this piece is in honor of all of you courageous women who have chosen to become Mamas, or wound up in this sacred role through circumstances over which you did not have control. Regardless of how you got here, I bow to your willingness to take on this epic assignment. The mother-child bond is unique. Becoming a mother is an unparalleled gesture into humanness. It opens you to a preciousness which one can only know through humble surrender. 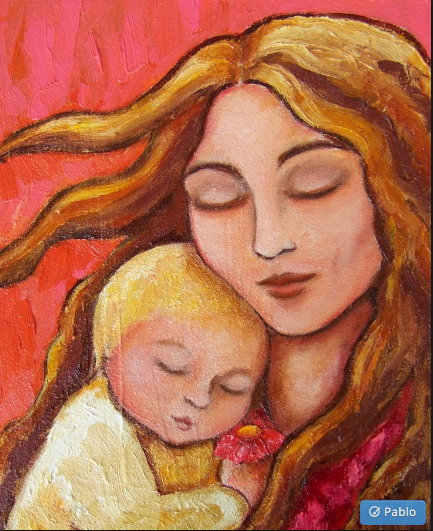 The journey of motherhood has certainly tenderized me. It insists that I continuously cultivate a deep selflessness. As mothers, we schedule our lives around the lives of our children, rising in the wee hours to do our morning meditations, yoga or exercise, fitting our work schedule into their school schedule while staying up late to do dishes, answer emails, write our blogs and fold the laundry after our little ones are asleep. Make no mistake, mothering is an act of service. In being of service, we are deeply rewarded with misspelled love notes, morning snuggles, dancing to Bruno Mars as he sings, “Treasure,” cracking up together at the silliest things, as well as an open invitation into the land of fairies, the opportunity to read aloud for hours with our child’s warm firmness tucked into our side, and the chance to go boogie boarding in our 50’s. It’s totally worth it, and mothering is a job that only the most devoutly generous of us would sign up for if we actually knew what it would entail. For me, one of the most significant things it entails is modeling what it means to be a woman, one who loves and cares for herself as she cares for others, one who gracefully walks through the world embodying the qualities of the divine feminine. I see how Meera watches me. She soaks up my every move in much the same the way that the roots of the plants in a springtime garden soak up a generous rain. They drink in the nourishment of the water in order to grow. She is growing up fast and I receive many reflections on my tone of voice, choice of words, what I wear (she is my personal fashion consultant) and how I’m being. The bar is high. I am curiously amused by how she seems to know so much at such a young age. I’m surprised when she says,”I’m the kind of person who…” I notice how she has become her own person and I revel in how steady she is in herself. She is confident, wise and caring at once. There’s no slacking in motherhood. Even after a full day of work and juggling the zillion things that make up my life as a single-mother, I still need to make dinner, help with homework, and more. Tired Mamas can be reactive (you are invited to forgive yourself for these moments of reactivity — we are all doing our best and we are only human). If I am sharp with my daughter and her feelings get hurt, we look at what happened, taking turns listening and sharing (ideally without interruption) until we both feel seen and heard. “Yes, it’s really best not to drag yesterday’s upset into a new day,” I agreed smiling at her capacity to track her feelings and articulate them. Meera’s level of emotional intelligence is far beyond what mine was at age ten. I’m blown away. Kids are deep, wide, and goofy as all get out. Mostly though, they are lovable. I will conclude with a vignette from later that Saturday morning. I was in the kitchen as Meera excitedly showed me a trick she could do with her fidget spinner (a toy trending at the moment with the kids around here). She got it spinning, threw her head back, and balanced the light blue device on her forehead. I said, “Wow, honey! That’s cool!” and cracked up! She gave me a casually tossed off, tween-style response saying, “It’s easy, Mama.” I get such a kick out of who she is and it’s moments like these that make my heart smile. May all of you beautiful Mamas feel lucky. May you know that you are not alone and that with all of the joys, sorrows, messes and triumphs; you are a magnificent being as you walk on the sacred path of Motherhood. Happy Mother’s Day! I celebrate you. If you’ve enjoyed this piece, please Follow me and feel free to Share it with others. To learn more about my offerings visit my website. I’d love to hear from you so please leave a comment below or send me a message. My name is Padma Gordon and I am a transformational guide trained to assist you as you navigate unknown territory. Together we will create practical structures that support you to open to deeper love, align with your true life path and cultivate harmonious relationships. My individual and group sessions offer a depth of somatic expertise and psycho-emotional training which when combined with a steady presence creates a safe container in which you have the opportunity to access the wisdom of your heart and land in your body as a deep resource. It is in this way that the body becomes a vehicle for healing, unwinding and deeper connection with self. I am your ally and look forward to connecting with you.